This will be a quick post on baking on a Weber grill. Zoomie, a friend of Mad Meat Genius has a kitchen project that has left her without an oven. It is rumored that she hired the company;"Pyramid Building & Kitchen Remolding Inc.". I suggested to use her Weber grill to bake. We use our covered kettle grill as an oven when we do not want to heat up the kitchen or free up space in the oven. We have a new favorite recipe for cornbread or you can use your own. Bank 30 lit coals on each side of the bottom grate of your grill for a total of 60 charcoal briquettes. Place your bread pan (cast iron works great) in center of grill and cover. Follow suggested cooking times. When time is up insert knife and if it pulls cleanly remove. With the Weber our cooking times were a fraction longer but very close. Enjoy. I've never thought about baking on my Weber- thanks for the lesson. Big Dude, The way the vents are situated and the position of the charcoals will actually create a convection heat that is probably more efficient than most home ovens. I made Chris Lilly's grilled pickles for the tailgate Sunday, they were fantastic. If only I hadn't packed away my iron pan! But I promise to try this in about a month when my kitchen equipment comes back. And you are correct - it's taking a long, long time. Even our contractor has been surprised. Aaron, Vents totally open, top and bottom. I am sorry I missed that tailgate. Also I totally stole that idea from Chris. 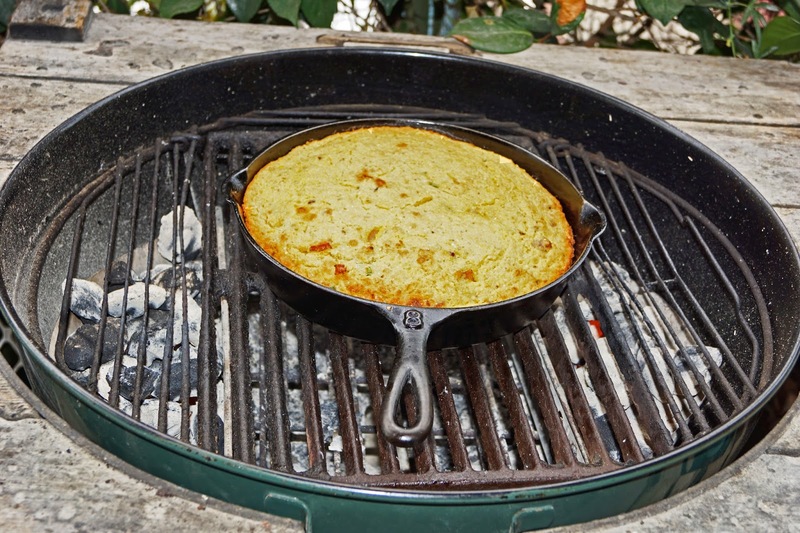 I love cornbread on the grill or smoker. Good stuff. I think Weber should hire you as a culinary consultant. The ones they use are drier than toast. Greg, I would love to be a rep and try out Weber products. I get a lot of information about Webers on http://weberkettleclub.com/ It is a great resource.